How will the World Cup impact urban transit in South Africa? Photo by shizhao. The 2010 FIFA World Cup South Africa is now less than two weeks away. An estimated three million fans will be pouring into stadiums in South Africa’s nine host cities to watch the games, and hundreds of millions more will have their eyes glued on South Africa on TV sets around the world. Now is a good time, then, to look at how the Cup has had an impact on sustainable public transportation that will last beyond the final game. In 2007 the UNDP highlighted South African cities’ unjust urban spatial dispersal (with poor people on the outskirts of cities, far from reliable public transport and economic opportunities) and the country’s good – but dangerous – road network (with approximately 45 fatalities per day on just about 750,000 kilometers of road). The good road network and poor public transportation have led most middle- and upper-class South Africans to use private vehicles, leaving the poorest South Africans to contend with the dilapidated, inadequate and unsafe transportation infrastructure. So how has the situation improved in cities around South Africa in preparation for the World Cup? 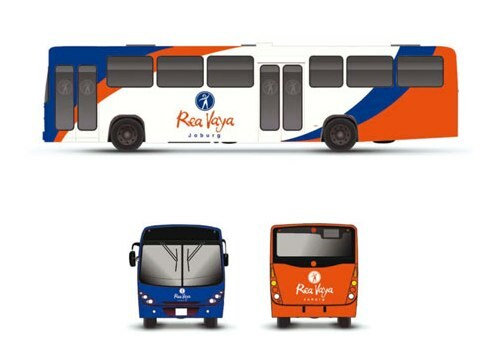 Johannesburg launched the Rea Vaya bus rapid transit (BRT) system in August 2009 and added a network of shuttle buses and new routes through May 2010; expansion to periphery townships is scheduled through 2013. Currently, Rea Vaya has 121 buses, which cover a 25.5-kilometer area and carry 29,000 people a day. It is estimated that Rea Vaya will reduce carbon emissions by 382,940 tons by 2013 and 1.6 million tons by 2030. By 2020 the city plans to roll out 122 kilometers of mainline BRT corridors and 250 kilometers of feeder routes, with a long-term goal of making the system accessible to 80% of the people of Johannesburg. Rea Vaya will also facilitate economic development in poorer, peripheral areas, and has already created tens of thousands of jobs in the city. The price, at R$8 (around US$1) for a combination of services, is much lower than private minibus taxi fares. In response to the BRT, dejected minibus taxi drivers – who formerly held a monopoly over public transportation in the city – have staged violent protests, which have marred Rea Vaya’s first year and highlighted the difficult economic transition to a more efficient BRT system. Still, the BRT might not detract from angry taxi drivers’ World Cup business as much as they expected. 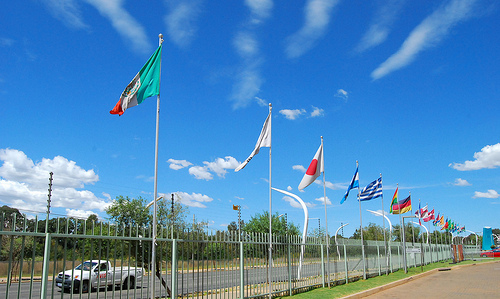 The city just announced that a crucial route along Oxford Road to Sandton won’t be ready in time for the World Cup. In the meantime, the Gautrain – Africa’s first high speed rail line – will open on June 8, three days before the World Cup opener. The train network will cover 80 kilometers once completed and will include two main lines: a north-south line from Hatfield to Marlboro and an east-west line from Park Station to Johannesburg International Airport. The train will eventually link Johannesburg to the capital Pretoria, 60 kilometers away, but won’t be taking fans to the city’s World Cup venues. Cape Town more recently launched MYCiTi, its integrated regional transport (IRT) system, which will already be functioning (with the branding obscured) during the World Cup. The system will include 43 Volvo buses with efficient Euro-4 engines, including 35 12-meter buses and eight articulated 18-meter buses. The city hopes to launch airport-to-city service by the start of June. Ron Haiden, the city’s acting manager for IRT infrastructure, said MYCiTi is designed for maximum accessibility, particularly for disabled passengers. There are boarding bridges for wheelchair access and tactile paving to guide blind passengers to the bus doors. In the meantime, planners are now working on a revised business plan after a due diligence report from PriceWaterhouseCoopers projected an annual operating deficit of R$118 million (approximately US$15.25 million). See more images of MYCiTi here. Port Elizabeth is also working on a BRT system but is behind Cape Town and Johannesburg. Still, the city recently received 14 of 25 articulated Volvo buses ordered from Brazil. The buses, also equipped with Euro-4 engines, have a capacity of 115 passengers each. 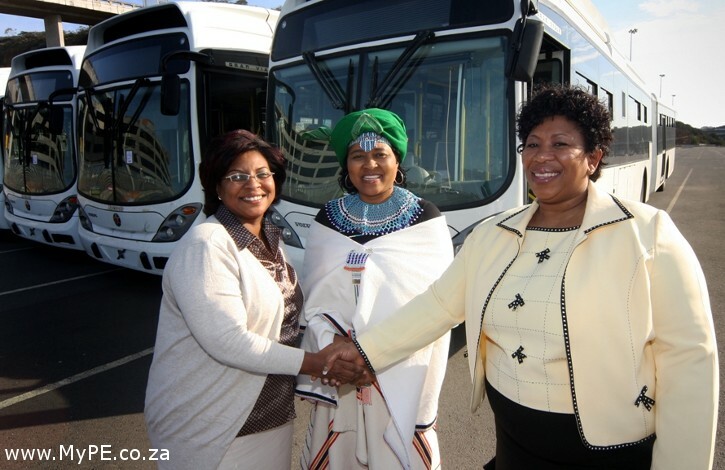 Port Elizabeth has also ordered one prototype 12-meter bus to test in its BRT system. During the World Cup the buses will be operated by Laph’ Umilanga Transport Services Cooperative Ltd, and will be incorporated into the city’s BRT system after the Cup. More profiles to come on transit systems in Durban, Pretoria and other host cities.